I know last week I said I wouldn’t be sewing for a while- and it turns out I lied. I stole a few unexpected hours tonight to start a baby quilt. Another baby quilt. You see, my husband’s brother will be welcoming his first child at the end of the month. While as a family we are not exactly close, my first and probably only nephew gets a quilt, right? I’ve had it planned out for weeks- the very day that the Fat Quarter Shop released the free Blithe pattern, I knew it was just right. All along, I had been thinking HSTs on a white background, and here was a way to make it just a little more interesting… I borrowed the layout from S.O.T.A.K.’s baby sized version, which is so lovely. Tonight I pulled fabrics… always so much fun! I started with scraps and then added actual yardage as well. Astute viewers might notice some Tula Nightshade and Saltwater in the mix. I am so proud of myself for cutting into those! It took serious willpower. I got through all the plain HST blocks tonight. I will never get tired of looking at the magic of squaring up HSTs. I started playing with the layout just to get an idea of where I’m going. I’m quite happy so far- but also very, very doubtful that I will be able to finish this in time to take it on our trip back East at the end of the month. Frankly, it was naughty of me to steal the time tonight at all! SOOOOO many other things I should have been doing. But I had so much fun. Um, I mean, it’s for the baby so I had to right? Linking up with Sew Cute Tuesday and Let’s Bee Social. The windows on the left, the roof-top light on the right. Annie was adamant that we use a very dark fabric for the window panes rather than a lighter one. She wanted it to look like space. So I dug out this lovely Lizzy House Natural History constellation fabric that I bought specifically with my girl in mind, and I made window panes. But, I didn’t think of it until AFTER the entire top was pieced. Oh, did I mention? That the ENTIRE top is pieced? I just did the math. 34×22. 748 squares. Of course, there are those very few spots that aren’t simply one square. But still, 748 is close enough. Oi vey. I am NOT doing the math on the number of seams I sewed. All of them. All the seams in the world. 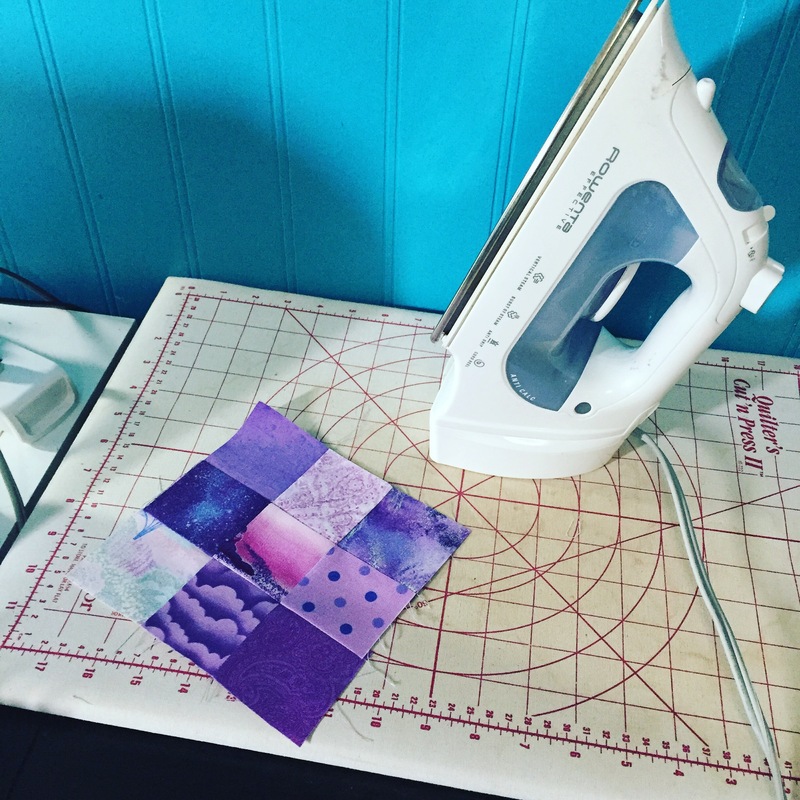 Linking up with Sew Cute Tuesday, Fabric Tuesday, and Let’s Be Social. I tried to spend all day Sunday sewing, but somehow my charming kiddos managed to flood the bathroom and my afternoon was spent on damage control. Sigh. That’s right- while everyone else was partying at Quilt Con, I was home mopping up toilet water. But before the water started dripping through the ceiling, for real, Annie and I got this far. We have continued with our system: she does the layout and I do the piecing*. I am so proud of myself- I have barely rearranged any of her squares. It’s kind of liberating to just not worry about what print is next to what, and are there too many polka dots here or too many dark purples there. The blank spots are where the few non 2.5″ squares go. I have to do some- gasp- math to get those bits right, so they’re waiting till I piece the rest. *so much piecing. I have refrained from actually doing the math the would tell me exactly how many 2.5″ squares are in this thing- but- it’s a LOT. This is what my sewing life has looked like for the last few weeks. 9 patch after 9 patch after 9 patch. But truly, I find them SO satisfying to work on. I have a system, and it’s been working. I stole a little extra time tonight and got some more done- SO close now! But, but, look at that face. He’s innocent, he swears. I’m linking up at Sew Cute Tuesday, Fabric Story Tuesday, and Let’s Bee Social. Here’s hoping YOUR helpers were more useful to you than mine were to me this week! Last year I had fun making a pair of coordinating-but-not-matching baby quilts for some frolleagues (that would be colleagues who are also friends…) Their baby boys were due mere days apart- though one decided to be as late as he could be and so they’re slightly further than that- but still within the same month. I finished the quilts, and got photos, and gifted them and everything, but never blogged them. So without TOO much further ado, here are my final finishes for 2015. Both quilts were focused on the doggy batik fabric- and also the remaining pieces of the rainbow batik roll that I used for my favorite quilt of last year. 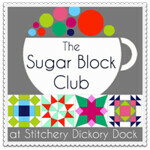 Both quilts were made up of pieced HSTs that came from this tutorial by Amy at Stitchery Dickery Dock. Quilt #1 got a backing made from some very very vintage Anna Maria Horner and remaining batik. Same squares, same border, same binding, same quilting, different layout: totally different feeling. This one got different backing, too. My heart totally melted a few weeks back when I saw Mr. Quilt #2 in his 3 month photo on FB- on the quilt… Hooray! Still not quite bigger on the inside…but closer! 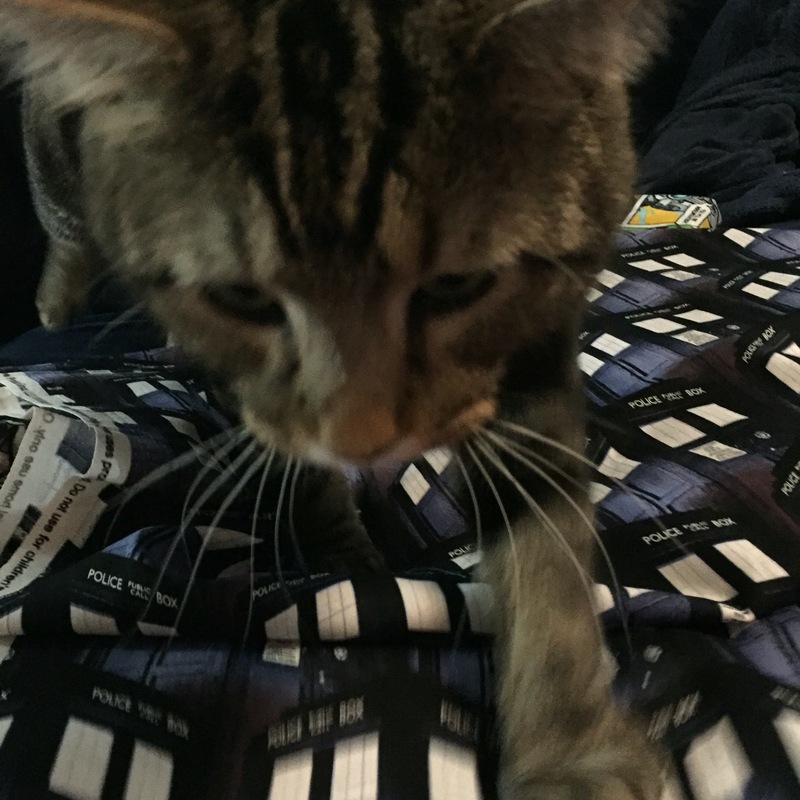 The Tardis is growing! Perhaps not as quickly as I would like, but still… My assistants (pictured below) and I took advantage of the day off from work/school (Presidents Day) and got some more done. Speaking of the squares- look at how pretty my kid makes them look while she’s working! Of course, we can’t leave them there because of that other assistant, the one who thinks I spent hours cutting them out just so he can nap on them… They get picked up and put away between layout sessions. So Annie worked on adding more rows to her layout, and I sewed. And sewed. And sewed. And here’s a closeup so you can see just how much fun we’re having with out fabric choices. Look for tentacles, unicorns, skulls, bunnies, butterflies, dolphins, and more. (Possibly not all in the shot below…) Because, truly, it wouldn’t be a quilt of mine without some silliness! Whee! Linking up with Sew Cute Tuesday, Fabric Story Tuesday, Let’s Bee Social, and Needle and Thread Thursday. Life got away from me, and I never showed you this lovely finished baby quilt. I got it bound and washed just in time for the baby shower, and even managed to snap a few photos before gifting it. 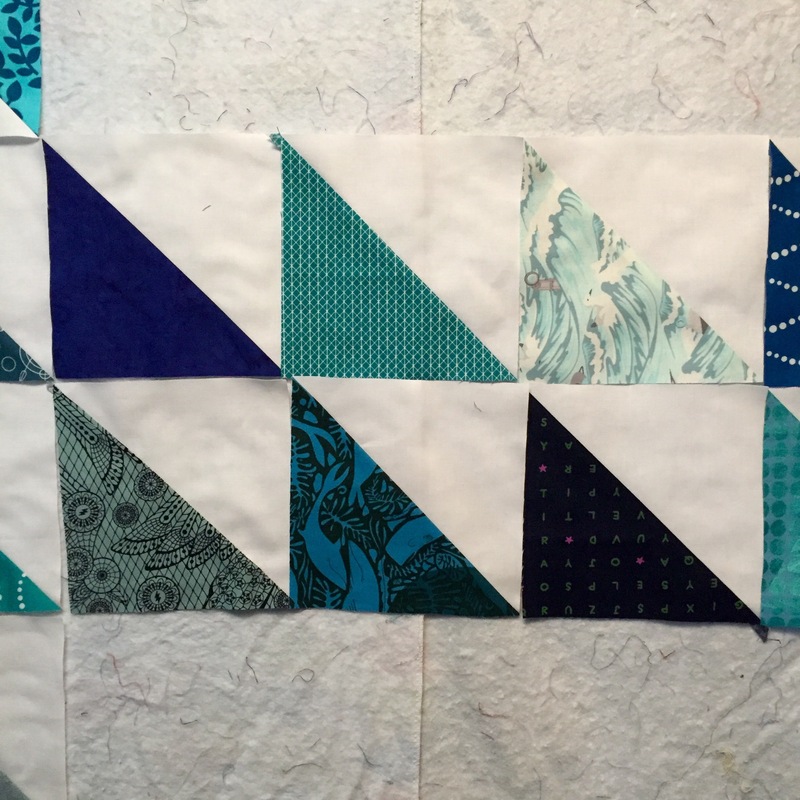 There’s that pop of aqua that I used for a binding- I really do love how it finishes the quilt off. I love this backing- it’s a perfect companion to the front, it works with the binding, I like the play of the stripes with the quilting lines- AND- it was on sale! Her hair is ALSO inspired by nebulae- sense a theme? I think she’s got a pretty decent eye! We’ve got a very sophisticated system going, with piles of tiny squares on the ottoman. Once I got a full section sewed together, I started really being able to see where we’re going! It’s working! I can see the Tardis starting to emerge from all those squares. Soon, Annie will have to finish the layout… but meanwhile, the 132 squares that are ready to go should keep me busy, right?